The majority of willow is coppiced on an annual rotation and can vary in size between 1- 8 ft in length, depending on variety. Willow with the bark left on is known as brown, steamed willow is black, willow with the bark stripped is white and stripped willow boiled with the bark is called buff. Willow is normally graded and sold by length to the nearest foot and can be purchased as ‘bolts’. A bolt is a bundle of willow which is 1 Yard and 1 inch circumference at the base, willow may also be sold by kilogram weight. Longer rotation willow, cut every 2-3 years,and can be over 12 ft high can be used for living structures and sculptured work. 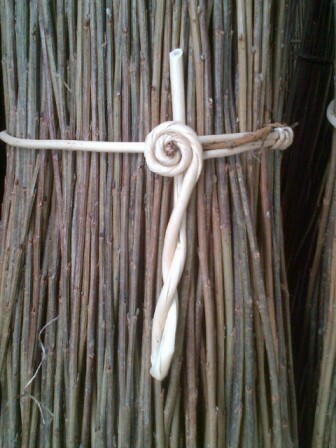 Larger willow rods may be sold individually or in bundles. Willow growing has long been associated with the Somerset Levels which provide ideal growing conditions and a long history of expertise providing continuity and quality. Different willow varieties grow well in different areas and you may find a willow grower near you to meet you weaving needs.